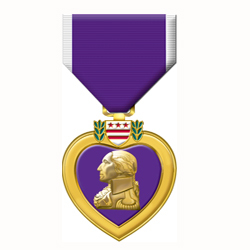 Authorized in 1932, a modernized version of the original Purple Heart as established by George Washington in 1782. It is awarded for combat action only, and is awarded to any person wounded in action while serving the Armed Forces of the United States. It is also awarded posthumously to the next of kin of personnel killed in action, or who died of wounds received in action after April 5, 1917. General George Washington established the original “Purple Heart”, then called the Badge of Military Merit, on August 7, 1782. To honor Washington on the 200th anniversary of his birth, General Douglas MacArthur, USA, issued General Orders on February 22, 1932, authorizing the current Purple Heart medal, which features Washington’s profile in relief and his family crest.